When actress Julie Cox was looking for the perfect birthday present for her partner, she accidentally stumbled on a new business idea! She tells the story of how she started Luke Drew This. I lived in London for 20 years working as an actress. Then I did all the things that are not recommended in maintaining a healthy career in the entertainment business – I moved out of London, had a baby and turned 40! Did your career change after having your son Luke? And if so, how? I went back to work when Luke was very young, but I was still breastfeeding and it was a disaster. Feeding routines and filming schedules are not mutually compatible, as I soon found out. I decided to wait until he was older, then it got harder to find the right work that would fit around looking after him. My partner also works in the film business and is away a lot, and we have no family living nearby, so I found myself struggling to do both. Starting my own business has been the first time in my life I feel in control of my own choices – it is daunting sometimes, but incredibly rewarding. I think a lot of women struggle with work after having children simply because the traditional support network of family living nearby has dissipated and the financial burden of childcare is so great. What inspired you to start Luke Drew This? One day he drew his dad with his dreadlocked hair and I absolutely loved it (it’s now my logo). It was my partner’s birthday and I knew the best present for him would be that drawing on a T-shirt but I couldn’t find anyone online who could really do what I was looking for, so I approached a local printer in Bristol (which happens to be a really creative and inspiring place to live). The first T-shirt was such a success that I started taking requests from family and friends… and friends of friends. The more orders I received, the more I realised how much I loved the drawings and making unique gifts from them. There are so many ‘personalised’ gift options out there but when you really look at them, they are mostly templates to customise. I wanted to make something genuinely personal for each customer that would be guaranteed to make them happy. I was very lucky to find a printer in Bristol who loved my idea and was very supportive on my journey to perfect the process and make sure each order was the standard I wanted. I also knew I wanted to focus on organic and ethically-sourced products. There was a lot of trial and error before I felt confident that I was going into business with products of a really high quality. Impeccable customer service is also critical for me as word of mouth recommendations are where most of my customers come from. The feedback I’ve had has been really encouraging. What have been some of the challenges you have faced creating Luke Drew This? My computer skills before starting my own business were at best described as ‘poor’! My biggest challenge has definitely been teaching myself so many new ones. From learning website design and Photoshop to grasping how to use social media (I’m still working on that one) understanding marketing, doing admin… it’s a lot of hats to wear. As an actress I also wore a lot of hats, mainly in costume dramas, but I was always told where to stand, what to say, and when to say it. The success of Luke Drew This is all down to me. The other big challenge was overcoming the fear of change and committing to the business, but once I started I never looked back. And what have you loved most about it? The drawings! When I get an order in it’s exciting to see what the next doodle or masterpiece will be. There is no such thing as a bad child’s drawing, they are all wonderful, sometimes unusual but always magical. When I receive an email saying thank you, how much their gift was loved and how intensely proud the kids were to see their drawing transformed into something else, I also feel a great sense of achievement because that’s exactly what I set out to do. Who are your customers, and how do they find out about you? I make gifts for mums, dads, uncles, aunties, grannies, granddads, kids and, at the moment, teachers. The bags are a huge success as end of term thank you gifts. I sell mostly through my website and notonthehighstreet.com. I’d love to have that moment I suppose singers experience when they first hear their music on the radio – seeing someone walk down the street wearing a bag or T-shirt I have created. That would give me a feeling of real joy. Also being happy and confident enough that it’s all going well, and not to wake up at three in the morning worrying about the email or blog post I didn’t get round to sending! How do you balance your work around being a mum? Since Luke started school it has been a lot easier to find the time to focus on work, but it still amazes me how you think you have hours in the day only to look up to see you have minutes before the school gates open. I work most evenings too, usually with the help of a glass of wine. I would say just start something. It’s the only way to learn and you will soon find out if it’s going to work for you. And make sure that you are passionate about whatever you choose to start your new journey in. When there are moments of frustration and doubt, of which I’ve had many, your belief in what you do is what will keep you going. 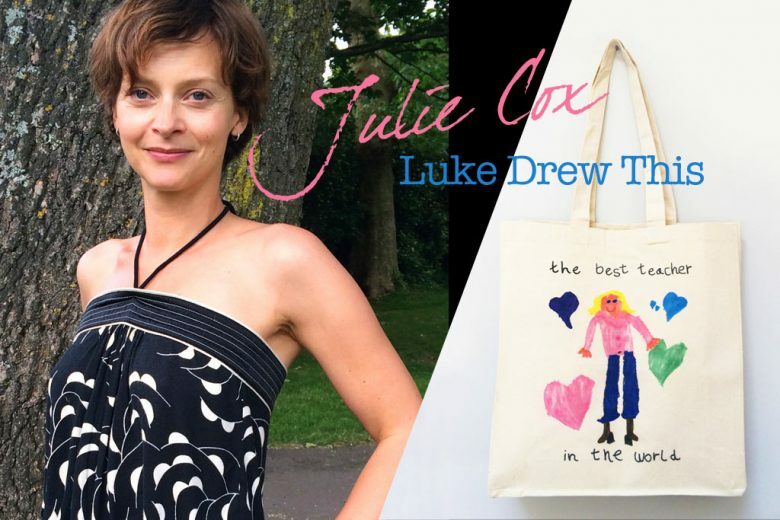 You can find out more about Julie’s business, Luke Drew This, on her website.